After completing the Research Logs, you are ready to begin your search.. If the records you want are at home, find them. You may want to photocopy some of them. Once you have the document or a copy of it, open the Family Research Folder. Locate the Research Log pertaining to that document. 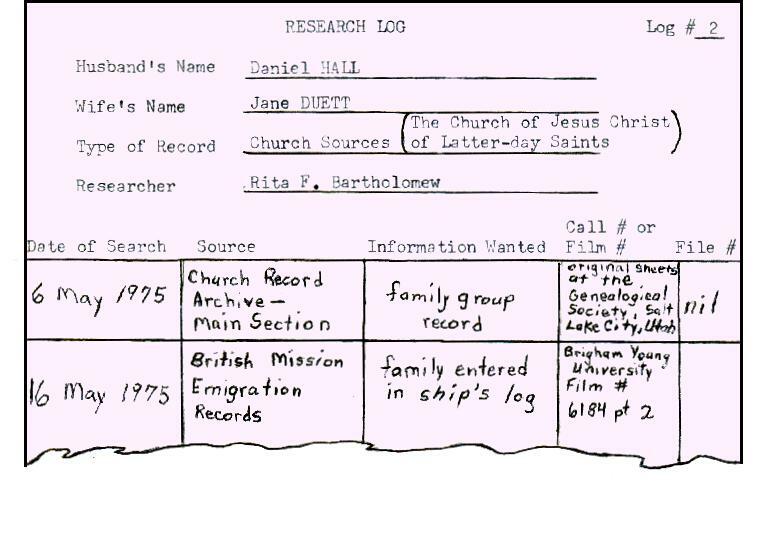 In this case, the document is found at home, so find the Research Log labeled Home Sources. Enter the date, indicating on which day, month, and year the document was found. If you could not find the appropriate document, still write down the date you searched for it and write “not found” in the place reserved for a file number. If it is necessary to go to a library to locate information, use the Research Logs to help you remember what you want to find there. Locate records in a library by searching in books or on microfilm. The Research Log is an excellent place to write down the call number of a book, or the film number of microfilm. Pull the proper Research Log, and write the call number or film number beside the name of the item you are researching. After researching a book or microfilm source at the library, and extracting any pertinent information, record the date on the proper Research Log. Additionally, remember to write down the name of the library and any call numbers or film numbers of researched sources. If no information was found in a particular source, indicate that in the place reserved for the file number. 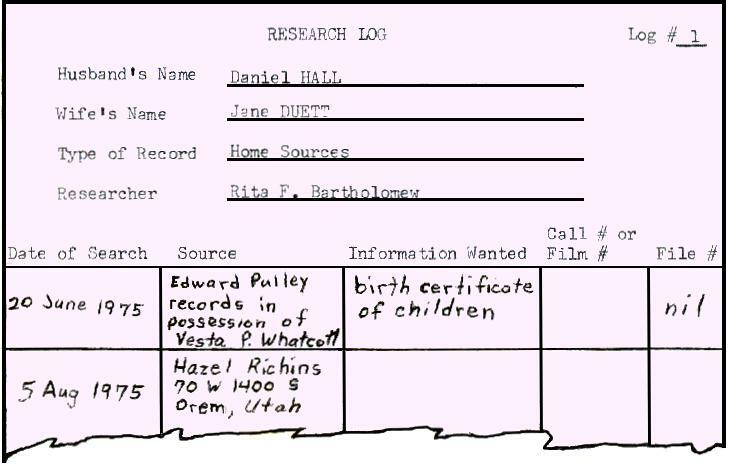 Then record the date you did the searching, the call number or film number and the library name, as explained above. Though you did not find anything, it is important to record where you looked, so you will not waste time searching there again. While you are in the library, you may come across a new book, microfilm, or any other source to search. Don’t feel that because it is not on your Research Log you cannot look at it. When this happens, instead of using a scrap piece of paper to write down where you want to look, simply add the newly discovered source to the correct Research Log. Be sure to record the call number or film number, which library you are using, and what you want to find in that source. Then go look at the source, unless you are out of time. In which case, since it is listed on your Research Log, you can easily check on it when you return to the library. After you have interviewed someone and/or perused their “home sources,” turn to the proper Research Log and fill it out as described above for Home Sources. Genealogical resources are abundant on the internet. Sources found on the internet need to be recorded under the proper Research Log. Be sure to list the site where the document was found, as well as the source of the document. For example the US Federal Census for 1880 can be found on several different web sites. One reason it is important to list the Internet site used is that the quality of the scanned document and the indexing process used can vary between web sites. It is extremely important to list the places you searched online and what you looked for, so that in the future you won’t waste hours of time doing the same searches again and again. It is much more fun and profitable to check new sources. You can also list variant spellings that you searched for on the Research Log. Again, this helps avoid duplication and wasting time. How to enter information on the Correspondence Index, Research Log, and Index to Research Findings when researching through letter writing is covered in Chapter 9. Though fifteen sources may be listed on your various Research Logs, you may find complete documentation for your Family Research Folder after searching only twelve. If this happens, you do not have to look at the other three sources unless you want to look at them. You are not a slave to your Research Log — it is your servant.